The iPhone X was released in November 2017, and the iPhone 8 and 8 Plus dropped right before it, but the hottest news right now revolves around the 2018 iPhone releases. The rumor mill regarding the iPhone X's successor started churning out speculations on names, cameras, display size, and more almost immediately after last year's devices, and there have been many new leaked details since. We expect the next big iPhone models to include a lot of the features that the 10th-anniversary edition has, including aesthetics and form factor. As we've come to rely on from Apple, these things will all carry improvements over the last model, big and small, with some extra juicy tidbits. But what exactly will we be holding in our hands when fall 2018 comes around? As we get closer to their official announcement, rumors about the upcoming 2018 iPhones have started to pick up steam. Leaks should still be taken with a grain of salt, at least until we get closer to the assumed fall 2018 release. That said, here's what we know so far about the upcoming 2018 iPhone models, which should not be confused with the rumored new iPhone SE model (which probably won't even happen). 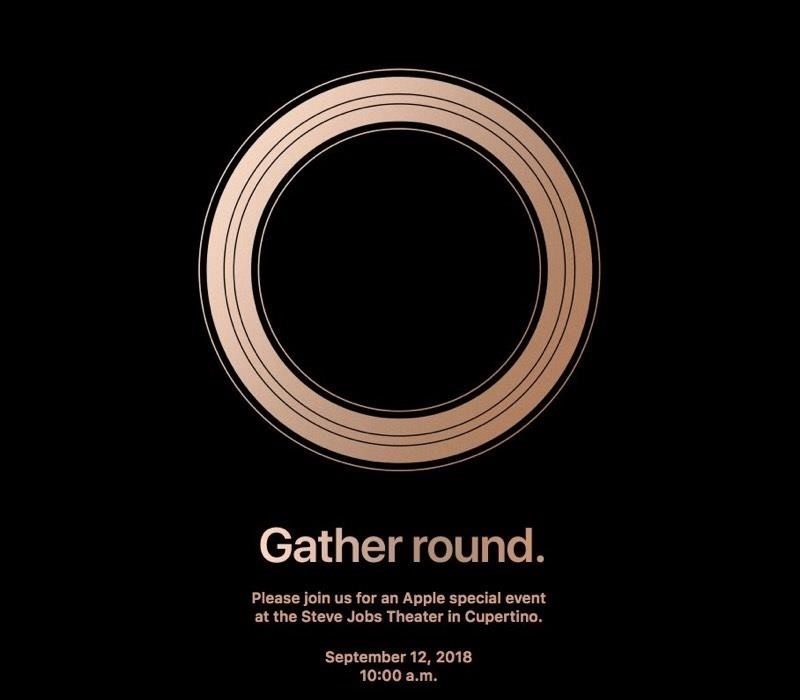 Thursday, Aug. 30, Apple sent out emails to journalists inviting them to a "Gather Round" event on Sept. 12 at 10 a.m. PT. The event will take place at the Steve Jobs Theater in Cupertino, CA, just like the previous event. The "round" mention and circle on the invites obviously point to the circular Apple Park building, though it may have a hidden meaning yet unknown. Along with the announcement of this year's batch of iPhones, Apple will show off the final version of iOS 12. CNET speculates that the flagships will officially go on sale around nine days after the unveiling, becoming available on Friday, Sept. 21. A German site goes even further and claims this year's crop of iPhones will be available for preorder two days after the announcement. According to MACerkopf, German service providers will accept pre-orders for the new iPhones starting on Sept. 14, 2018. Current rumors suggest that Apple will release three models of the iPhone next year, just like they did with the iPhone 8, 8 Plus, and X. As far back as November, analyst Ming-Chi Kuo of KGI Securities suggested that there will be a nearly identical successor to the iPhone X at 5.8 inches, a "Plus" size variant at 6.5 inches, and a mid-size one at 6.1 inches. Later rumors suggested that the 6.1-inch model might actually be the iPhone SE 2, but we're not betting on that because the size should (hopefully) remain at 4 inches. With the announcement just around the corner, credible leaks have now surfaced to further solidify this rumor. 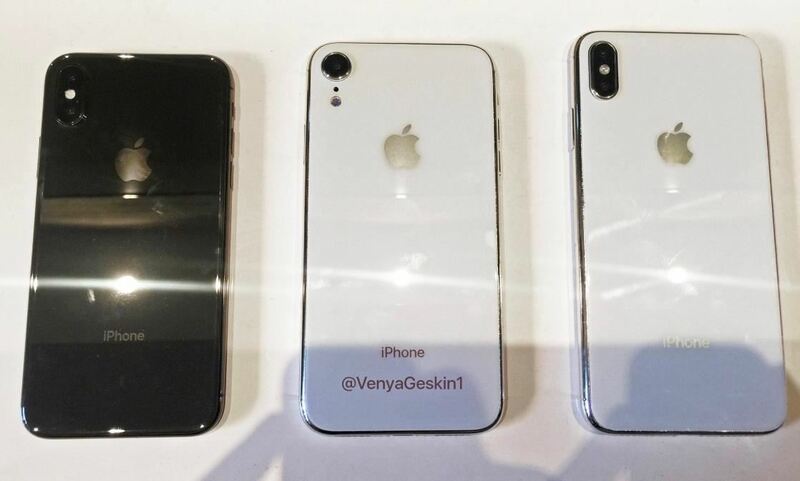 None other than famed leaker Ben Geskin has recently posted images of what appears to be non-functional dummy units of the upcoming iPhones. In it, we can clearly see the size differences between the three models, along with the single rear camera unit present on the 6.1-inch model. 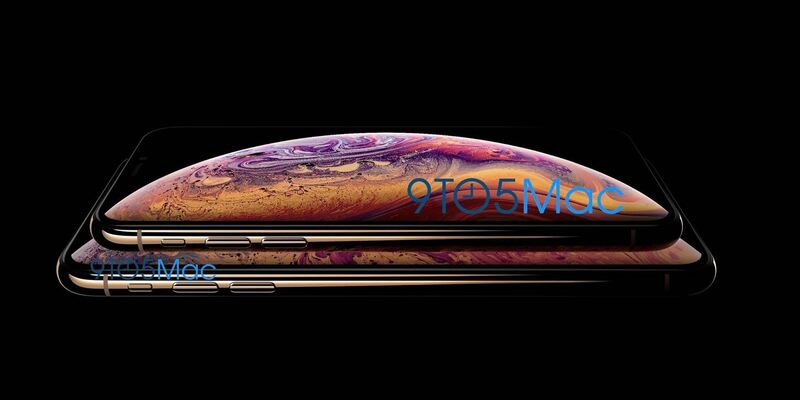 To further solidify this rumor, 9to5Mac posted an exclusive Apple photo of the 5.8-inch and 6.5-inch models, purportedly called the iPhone XS and iPhone XS Plus, so we know the two OLED-equipped iPhones are all but certain to arrive this fall. Kuo also said in his November report that the 5.8-inch and 6.5-inch models will retain the X's all-screen OLED Multi-Touch display, known as the Super Retina HD display, while the mid-size 6.1-inch model will be a standard LCD Multi-Touch display with IPS technology, just like the iPhone 8 and 8 Plus Retina HD displays. While the mockup below shows an almost bezel-less design for the LCD model, its bezels on the top and bottom will need to be bigger than the other models to keep the LCD in place. The move to MLCD+ makes sense, as traditional LCD panels limit a manufacturer's ability to achieve a more bezel-less design due to their engineering. LCD displays need fragile edge connectors that run along the top or bottom of the screen, which necessitates thicker bezels to improve overall durability. In addition, newer MLCD+ panels are a marked improvement over its predecessor in terms of display brightness. In a nutshell, MLCD+ adds a fourth white subpixel to the traditional red, green, and blue (RGB) subpixel mix, giving it superior brightness, clarity, and efficiency over its predecessor. Of course, if you'd like to learn more about MLCD+ and the improvements it brings to the table, be sure to check out our article on it. However, again, this conflicts with rumors that the iPhone SE 2 might actually be the 6.1-inch model. Either way, there is definitely some confusion on what's going on with the rumored 6.1-inch model, so it could be anything. To further add meat to this claim, a video has surfaced of what appears to be a dummy unit for the budget-friendly 6.1-inch iPhone alongside the top-tier 6.5-inch model. In it, you can clearly see notable external differences such as the rear camera assemblies, with the budget model sporting a single camera lens. If a new leak turns out to be true, the budget-friendly 6.1-inch LCD iPhone will come in a variety of colors in the same vein as the classic iPhone 5C. A recent report by 9to5Mac has uncovered a report by Ming-Chi Kuo, who predicts that the upcoming LCD iPhone will come in a variety of colors — white, grey, red, orange, and blue. To further add meat to this rumor, the European site Consomac has spotted a recent filing made by Apple in the European Economic Commission (ECC). In it, Apple lists a total of 11 iPhone models, which are A1920, A1921, A1984, A2097, A2098, A2099, A2101, A2103, A2104, A2105, and A2106. If you'll notice, the A19 and A20 models have three iterations, while the A21 model comes in five variants, indicating more color options on the latter. If the rumors are to be believed, the A21 model will be the 6.1-inch LCD iPhone. 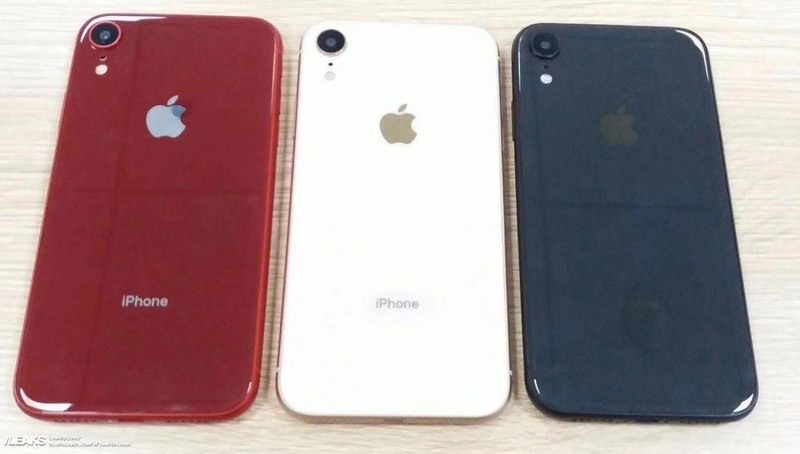 To back this claim even further, SlashLeaks has posted leaked images of the upcoming budget-friendly iPhone in red, white, and blue. We do expect the sensor to evolve slightly, potentially reducing in size (i.e., smaller notch) and improving in specificity … helping to further drive very strong growth for some Apple suppliers in 2H18 as the second generation of sensor ships in this year's new iPhones. Unfortunately, this possibility is becoming less likely as we get closer to the official release. 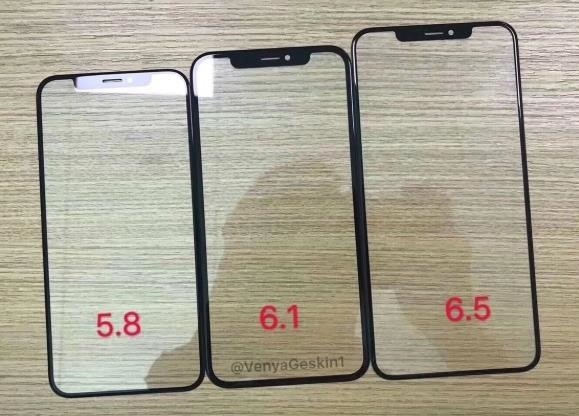 Famed tech leaker Ben Geskin has posted an image of what purports to be sample glass panels for Apple's upcoming flagships, featuring notches that appear roughly the same size as the iPhone X. It's worth noting, however, that because of its large screen, the notch on the 6.5-inch iPhone variant appears smaller in relation to its overall size, in addition to having thinner bezels overall. So if a smaller notch is one of your must-haves when considering your next iPhone purchase, the upcoming 6.5-inch OLED iPhone will be right up your alley. Apple is reportedly ditching 3D Touch — at least for the 6.1-inch LCD-equipped iPhone — to keep production costs to a minimum and make room for implementation of new technology. According to Cult of Mac, industry analyst Ming-Chi Kuo predicted that Apple will remove 3D Touch on at least one of the three flagship iPhones that's due to launch later this year. Ming-Chi Kuo added that the 6.1-inch iPhone will include a new technology that will supposedly make its LCD screen lighter and more resistant to physical damage. The new Cover Glass Sensor (CGS) process embeds the touch sensor in the glass panel itself and gets away from the more traditional method of being integrated into the display. The new CGS process will go a long way in making screens more resistant to impact and scratches, but also costs more to produce. Because of this, Apple will sacrifice 3D Touch starting with the 6.1-inch iPhone and will eventually be phased out entirely as it becomes standardized for all iPhones moving forward — if Ming-Chi Kuo's prediction comes to pass. Developing a reliable fingerprint sensor housed within the phone's touchscreen assembly has become an elusive goal for many manufacturers, with Apple notably ditching Touch ID altogether in favor of Face ID for the almost all-screen iPhone X. Luckily, in-screen Touch ID may still be featured on Apple's upcoming flagships, if a recent rumor is to be believed. According to SlashGear, a Korean site is abuzz with speculation that Apple is actively working on its very own ultrasonic fingerprint sensor to utilize on future iPhones. This type of sensor uses ultrasound to map out even the most minute details of your skin, and it is known to be the more accurate than light-based optical scanners and capacitive sensors that rely on electrical patterns. It's also the most expensive. Because of this, this new feature — if successfully developed in time — will likely only be available on the OLED-based iPhones, as putting it on the LCD-equipped 6.1-inch iPhone will make its production costs skyrocket. Those costs will be reflected in the iPhone's final price, making the budget-friendly iPhone out of reach for most consumers. If a new rumor proves to be true, Apple has given consumers more incentive to choose its OLED-equipped flagships over the entry model when they become available for sale in late-September. Taiwanese site Economic Daily News reports that the higher-end iPhone models will support the Apple Pencil, though not the LCD-equipped flagship. If true, this may be Apple's way of enticing customers into purchasing the higher-tiered models and push sales up for even higher revenue. Analyst Ming-Chi Kuo recently cast serious doubt over this claim, however, and Redmond Pie reports that Kuo released a research note to investors discounting the rumor, stating he didn't believe that Apple Pencil support from an iPhone would offer a "good user experience." Thanks to their larger screens, iPhone Plus variants from the 6 Plus onward are more akin to a miniature iPads with regards to app experience and feature tweaked native app UIs that are similar to their tablet counterparts. And thanks to the iOS 12 beta 5, it seems like this feature will carry over to the upcoming 6.5-inch iPhone. The ingenious folks over at iHelpBR uncovered this feature via iOS Simulator running on the latest iOS 12 beta and Xcode 10. In it, they tweaked the resolution to 2688 x 1242 — the OLED-equipped 6.5-inch iPhone's approximate screen resolution — and rotated it to landscape mode. 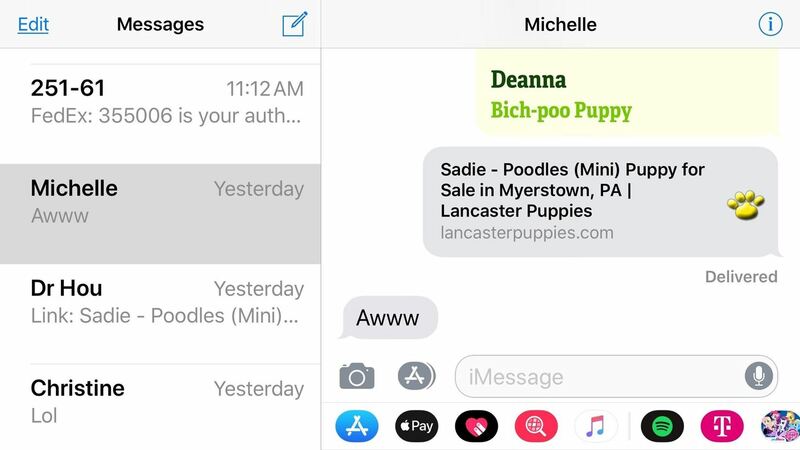 In doing so, they confirmed the presence of iPad-like tweaks to native app UIs, such as multi-window view within Messages and Contacts. The next generation's official name is still currently unknown. Apple may very well decide to reinstate the "S" branding now that its first decade of existence is in its rearview mirror. 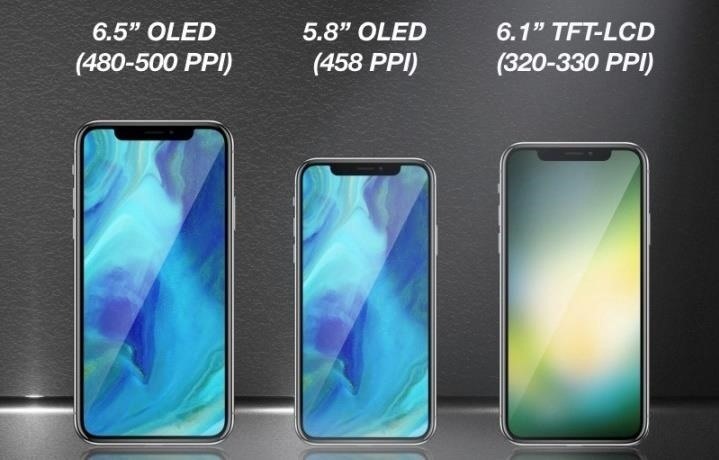 In fact, this is almost certain to be the case with the OLED variants, so we might be looking at an iPhone XS and iPhone XS Plus (or iPhone XS Max), but where does that leave the third model? If a new rumor is to be believed, the LCD-equipped 6.1-inch iPhone will skip the "S" entirely. According to PhoneArena, the entry-level flagship will follow on the iPhone 8's footsteps and be named the iPhone 9 to further set it apart from its OLED counterparts. Reports suggest that the TrueDepth feature found on the iPhone X's selfie camera might eventually make its way to the rear camera, too. According to GSMArena on Nov. 14, iPhones starting from 2019 onwards will carry a rear-facing 3D sensor to enhance Apple's ARKit and give infinitely more accurate measurements of distance as opposed to the estimates by the current camera setup. The company is allegedly talking to several component suppliers and evaluating its options. While that seems far away, it's also entirely possible that Apple can get this working in time for at least one or two of the upcoming 2018 models. I mean, Apple's Animojis will only keep us occupied for so long. In another statement by Kuo on Nov. 2, the 2018 iPhones will likely utilize the same 6P lens design currently found on the iPhone X as opposed to employing anything more advanced. The term 6P refers to a 6-element lens — 6 lenses made of plastic. With its rear camera specs, iPhone X has managed to strike a phenomenal balance between picture quality and form factor design, in our opinion, given how far we've come today technologically. Switching from a 6P lens to a 7P lens or a 2G3P hybrid lens, with camera module design largely similar to iPhone X's, would make for only limited improvements in aperture performance, we believe. Switching over to a newer 7P or hybrid lens technology would present strain on the 2018 iPhone's supply chain that merely isn't worth the minor improvements as stated above. In the end, Kuo believes that "Apple intends to avoid making manufacturing decisions that could lead to a repeat of this year's supply-constrained iPhone X launch." The Huawei P20 Pro was the first major smartphone to feature a rear camera with three modules, and it looks like Apple may follow suit and employ the same technology for its highest-tier model. According to Forbes, the upcoming iPhone X Plus will likely feature a three-lens setup for its rear camera to further enhance photography. While the specifics are currently unknown, the third camera module may be used to optimize low-light photography and address a weak point. As great as the iPhone X's cameras are, it still has a long way to go in terms of capturing images in low light, which became even more apparent when compared to the Google Pixel 2 XL. However, a three-lens rear camera may not show up until 2019. 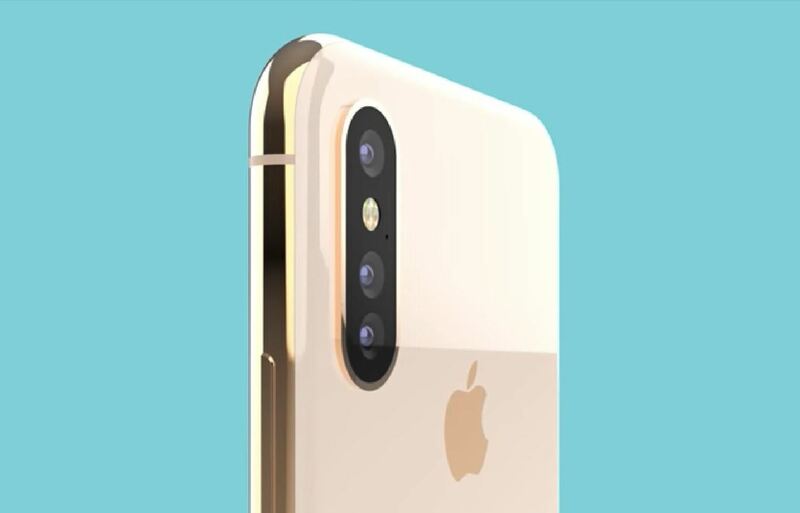 The schematics that Forbes referenced, which came from an unknown accessories maker, appears to show three similar-sized circles on the rear glass camera area, with a tiny mic to the right of them. While not drawn to scale, probably, this is likely just indicating the same setup the iPhone X already has with a flash in between two lenses. From what we see, based on those leaked schematics, it's unlikely it means three lenses since accessory makes need to at least know the general position of the flash, so it's probably just two lenses and a flash that are drawn — not three lenses. In yet another research note from Kuo on Nov. 6, he stated that the 2018 iPhone will have a redesigned metal frame that consists of more parts than the current iPhone X, primarily to improve reception and data transmission quality. If this turns out to be true, the next generation iPhone may very well be able to support faster downloads comparable to the Samsung Galaxy S9's 6CA capability (on the Exynos version of the phone) which lets it download data at speeds of 1.2 Gbps. As the followup to the iPhone X, the next-generation iPhones will naturally utilize faster, more powerful processors, though it's uncertain just how much of an upgrade the A12 will be over its predecessor. If a new leak is to be believed, however, we may have just gotten a clearer picture. 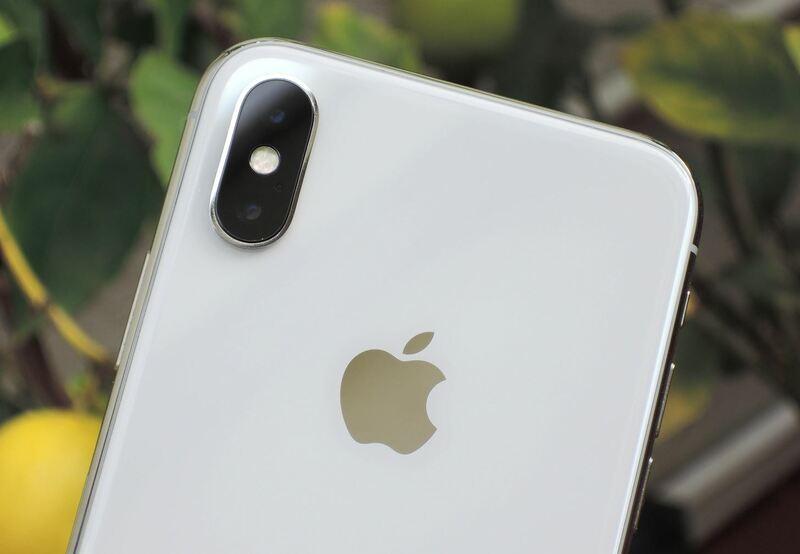 The French site iGeneration has uncovered benchmark results from Geekbench 4, which identifies the mystery device as iPhone11,2, published in late-June. 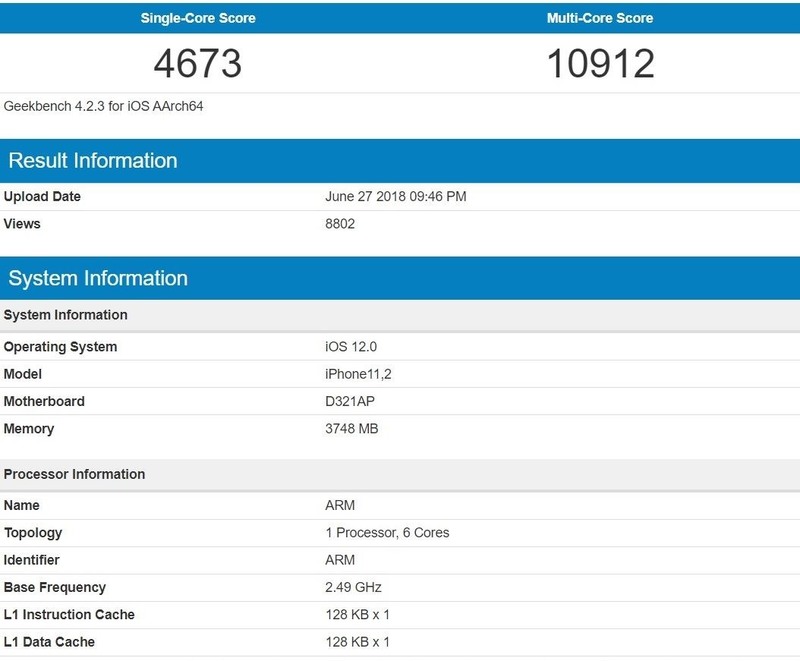 In it, the mystery iPhone posted average scores of 4,673, 10,912, and 21.691 for single-core and multi-core performance, along with the Metal-based Compute score, respectively. The processors featured a base frequency of 2.49 GHz. In comparison, the iPhone X posted average scores of 4,206, 10,128, and 15,234 for the same exact tests, with its A11 Bionic clocking in at 2.39 GHz. And while the iPhone X has 3 GB of RAM, the iPhone in question comes 3748 MB of memory, which equates to about 4 GB of RAM. Apple's upcoming flagships will be the first smartphones to utilize processors built on the latest 7 nm architecture. According to DigiTimes, Taiwan Semiconductor Manufacturing Company (TSMC) is gearing up for production of 7 nm process on the second half of 2018 to manufacture the next generation A12 processors that will be powering this year's crop of high-end iPhones. The shift from 10 nm chipsets as found on the iPhone X is another milestone in the quest for ever smaller, more powerful processors, and the A12 will undoubtedly bring a host of improvements with regards to speed and power consumption. Unfortunately, we'll have to wait for benchmarks to surface to see how significant these improvements will be. In a separate research note to investors on Nov. 17, Kuo claimed that the next-generation iPhone models will include Intel XXM 7560 and Qualcomm Snapdragon X20 modems. While this doesn't sound much, these new modems will enable faster data transmission speeds because both new chips support 4x4 MIMO technology. Previous iPhone models only supported 2x2 MIMO. In the same research note referring to new modems on Nov. 17, Kuo also predicted that at least one of the new iPhone models in 2018 would come with dual-SIM, dual standby (DSDS) capabilities that support LTE+LTE connections. Most DSDS phones support only LTE+3G right now. Likely, the 2018 iPhone would have one embedded SIM and the other removable, but it'd be nice if they were both removable. Native fast charging capabilities may finally arrive with this year's crop of iPhone accessories if this rumor proves to be true. According to a post on Weibo, Apple's 2018 lineup of iPhones will now come with a new generation of Lightning cables that ditch the traditional USB-A connector in favor of USB-C. In turn, this new USB-C to Lightning cable and charger will make fast charging a reality out of the box for iPhones and iPads moving forward. 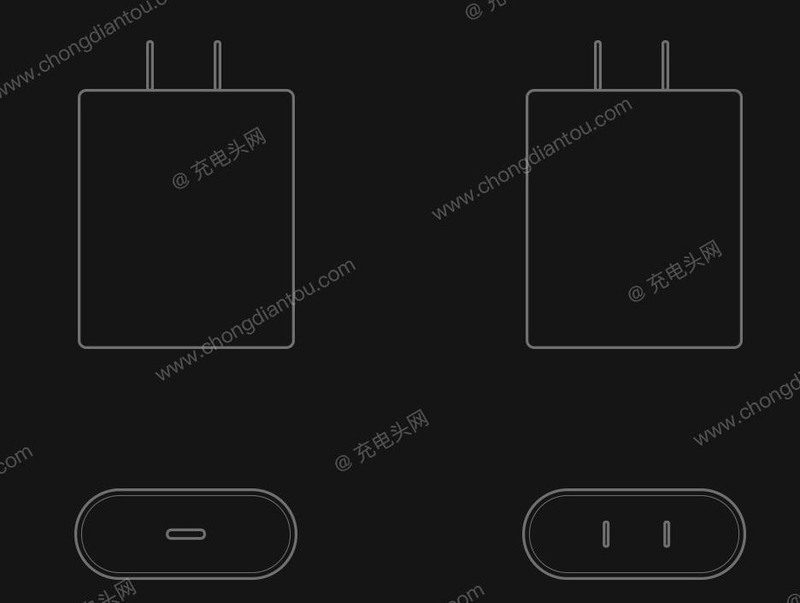 The upcoming iPhones will still retain the Lightning connector first introduced on the iPhone 5, giving iPhone owners across the board access to the new USB-C Lightning chargers and vice versa. So if your wife upgrades her iPhone in the future, you'll now be able to use your spouse's USB-C-based Lightning charger to fast charge your device whenever you need a lot of juice in a hurry. Recent reports suggest that the mid-range LCD-equipped iPhones will be priced well within the range of the current iPhone 8 series. Apple Insider has recently reported that, according to Ming-Chi Kuo, Apple will price the upcoming 2018 LCD models anywhere between $699 and $799. Ming-Chi Kuo didn't elaborate on the cost for the OLED-equipped model, however. But given how much the current iPhone X costs, it'll likely be at least $1,000. So unless you want to go back to LCD-quality screens, you better start saving now. That's all we have so far with regards to the yet-to-be-named 2018 iPhone models. Nothing was given away at WWDC 2018, so we'll probably have to wait until Apple's Sept. 12 event to know anything for sure. However, be sure to check back often as more details come flooding in during the run-up to Apple's 2018 premium flagship phone.